If you are a smart notebook software user, then all the data you store from your smart notebook is obviously very important to you. Smart notebook helps a lot to use the smart board and it helps a lot of people to present interactive lessons, create interactive presentations etc. A lot of people lose their data accidentally from their smart notebook software for sudden crash, virus attack, accidental deletion, human error etc. It’s a common thing on the internet that a lot of people want to recover smart notebook files. If your smart notebook has stopped working or you have also lost your smart notebook data, then you need to read this article. 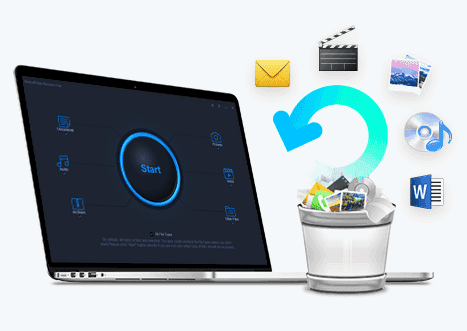 With the help of this article you will be able to learn everything about smart notebook recovery, how to recover unsaved smart notebook files and how to recover deleted smart notebook files in no time. So follow this article to help yourself in this issue by using the best tool available on the internet. If smart notebook has stopped working on your computer or for any other reason you have lost your important smart notebook files, then the best way to recover smart notebook files is by using iBeesoft Data Recovery software. This one of a kind tool can recover files from external hard disk, hard drive/partition, RAW drive, SD card, USB drive etc. in a few clicks. You won’t need too much time to recover unsaved smart notebook and smart notebook missing images. This software is really special and easy to use because it has all the advanced features that no other data recovery software can give you. If your computer faces system crash, accidental deletion, virus attack etc. issues, it can provide you with stable recovering smart notebook files. You can use it to recover almost all kinds of lost and deleted files on smart notebook. 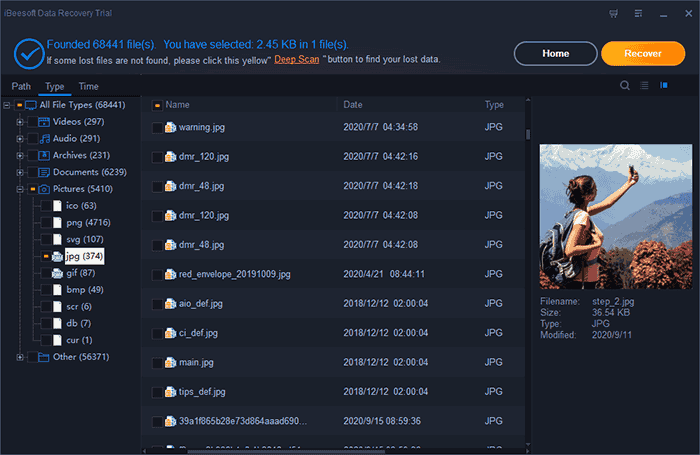 The undelete or format recovery tool supports various devices and operating systems including Windows 10, Windows 8, Windows 7, Windows Vista, Windows XP, and Windows Server. Recovering unsaved smart notebook files can’t get better than this. Here is how to recover smart notebook files by using iBeesoft Data Recovery tool. First you need to download and install the software on your computer, either install the Windows or Mac version. Then run the software on your computer to get the home interface in your computer screen. Step 1. 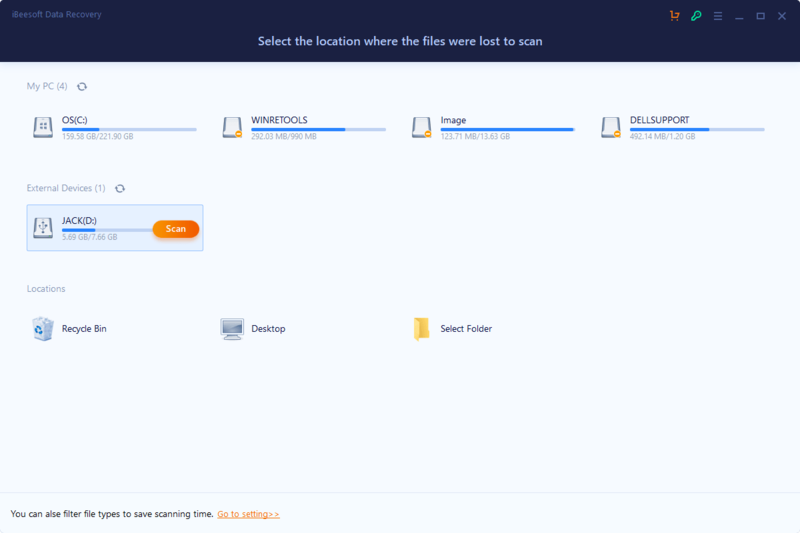 After launching the smart Notebook files recovery software, you need to choose the data that you want to scan from your computer. As to recover smart notebook files, images, videos or other files, please keep the types selected and uncheck the unwanted file types. Then you need to click on the "Start" button to recover deleted smart notebook files. Step 2. After that, you will get a list of drives from your computer on the software interface. Please choose the one that contains your smart notebook files and click on the "Scan" button to go to the next step. Step 3. The software will scan the computer drive that you have chosen and display all the data after the scanning process is finished. From there you need to filter your smart notebook files from the left side menu and select the files you want to recover. Finally, find the target Smart Notebook files and click on the "Recover" button from the top right corner of your screen to recover the smart notebook files. You need to keep patience till the smart notebook recovery process completes. The time depends on the file size that you are recovering. Within a very short time all your smart notebook files will be recovered on your computer. Smart notebook files can be deleted, lost, stop responding or shut down for various reasons. If your smart notebook has stopped working, then this part will definitely help you a lot. Here are some of the possible solutions to smart notebook has stopped working. You can open any other ".notebook" file, or create a new smart notebook file to determine the reason for causing the software to crash. Try resetting the Smart Notebook toolbar settings into their default forms. You can do that by choosing the gear icon from the toolbar and select "Restore Default Toolbar" option to proceed. You need to log into your computer by using a different user profile and try using smart notebook. If in this case, the smart notebook tool doesn’t fail, it means that your main user profile may be corrupted and you need to recreate it. You can easily determine if the crash is caused due to permissions or user profile settings, by accessing an account with full administrative permissions. You can try using the "Smart Uninstaller" to completely remove smart notebook software. Then you can download and install the latest smart notebook software on your computer. You need to use a fully updated operating system. Also you can keep the the drivers for the video card updated. This article will help you to understand everything about smart notebook recovery. You don’t need to know how to recover smart notebook files, just follow this article properly and you will be able to use the best tool on the internet for recovering any kind of file. Maybe you have panicked a lot to recover unsaved smart notebook files. Now you don’t have to worry anymore at all. Start using this data recovery software to get back all the smart notebook data that you lost accidentally.